Taking an automotive design into production is a costly and time consuming process. Going from initial sketch to finished vehicle takes many different teams a huge amount of time and effort. Turning a sketch into a clay model, or building a 3D model in CAD, can take weeks of work and be extremely costly. In each of these steps the designer’s expression, their true design intent, is diluted with each new interpretation of the design. We asked, what if automotive manufacturers had a tool that could help facilitate the creative collaboration of different teams in a fast and cost-effective way, ensuring the designer’s original creative vision and expression remains intact at the end of the process? 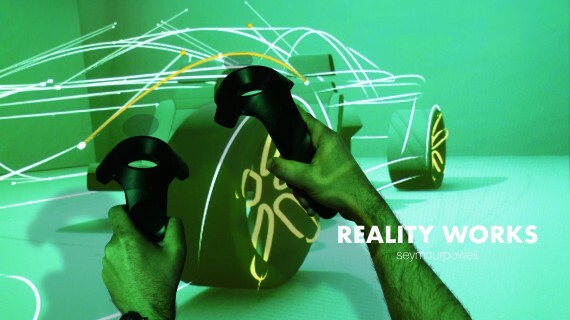 This led us to create RealityWorks: a sketching and modelling application that uses Virtual Reality to enable a new way of designing for the automotive industry, bridging the gap between expressive vision and the final delivered vehicle. In RealityWorks we’ve witnessed designers being able to craft their vision in a way that vastly reduces misinterpretation and dilution of the design intent by clay and CAD modellers, allowing them to express themselves in ways that are not possible in traditional CAD software. Designers can sketch in virtual space, instantly replicate and pick up their designs to understand them in 3D, and get instant access to the industry safety regulations that their designs have to adhere to. We believe that by incorporating RealityWorks into existing workflows, automotive companies will be able to increase their productivity, reduce lead times, and maximise the creativity of their design teams. We explored rough mock ups of the virtual environment and also the controllers. We tested these with designers from multiple disciplines, and through a series feedback loops we were able to refine the interactions with the drawing tools. With communication between teams being a key factor in how designers’ creative expression is shared, we’ve allowed multiple parties to dial in to the virtual design space and collaborate. In doing so we challenged ourselves to make this virtual conversation be as compelling and as productive as the best design meetings that take place in the real world. We also came to understand the importance the virtual environment you are in. When it comes to encouraging creative expression, sound, space, and haptic feedback all play crucial roles in the user’s adoption of the new paradigm. It became clear that creative expression is not only affected by how you interact inside a virtual space but also how you feel when you’re in it too.